Following the initial success of the Hubard Gallery, its founder Mr W. C. Smith went on to employ other artists with varying abilities and styles though they were rarely, if ever, credited for their work. 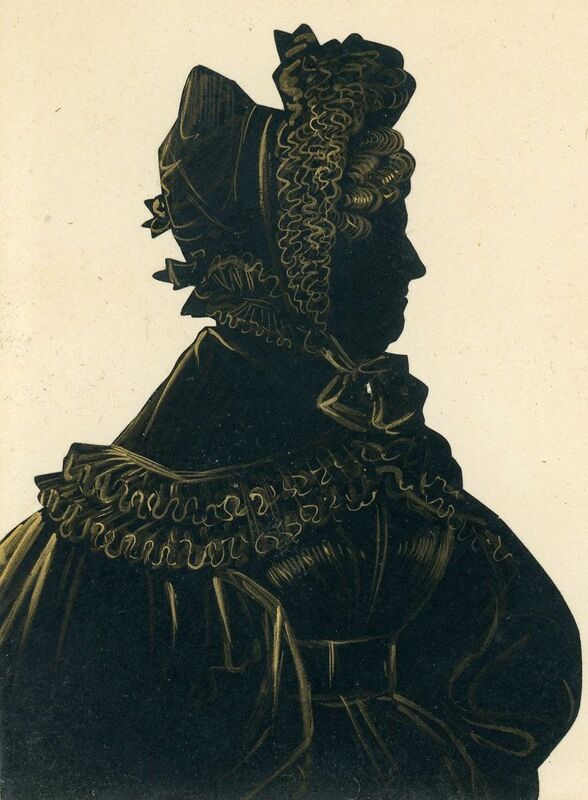 This is an example of a silhouette from that period. 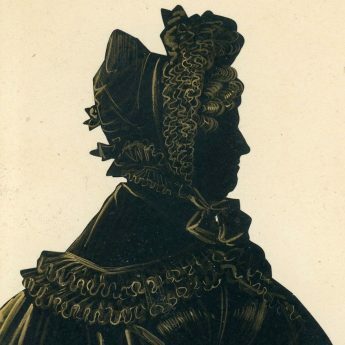 It shows a more mature lady wearing a wide-sleeved dress buckled at the waist and with a double frill-edged pèlerine. Her curled hair is just visible under her frilly Babet cap that is tied under chin. 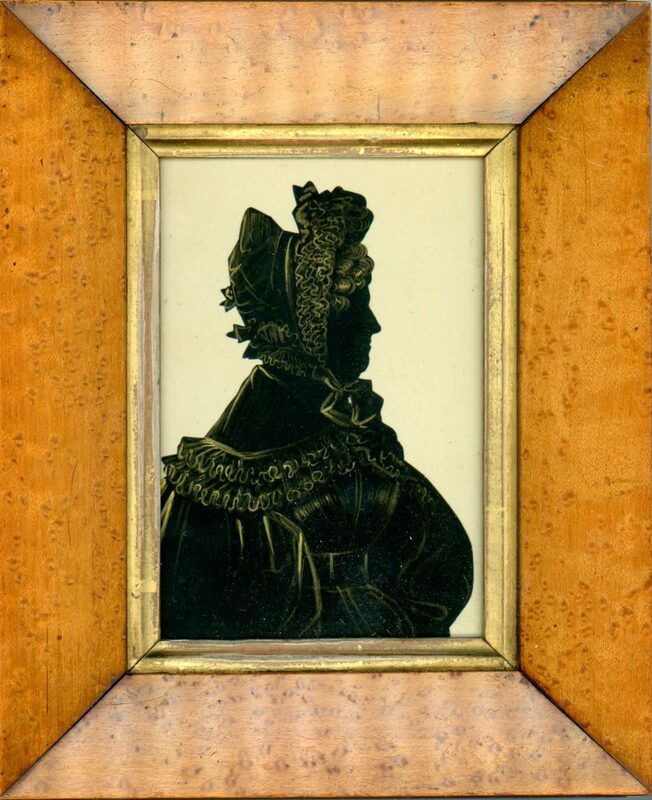 The silhouette is presented in the original bird’s eye maple frame with a gilt slip. The frame is backed with the Gallery’s trade label no. 5 which was in use during 1831-1832. 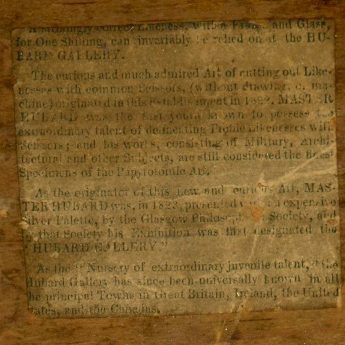 According to newspaper advertisements, the Gallery was based in Oxford during most of 1831 and in Cambridge during 1832. 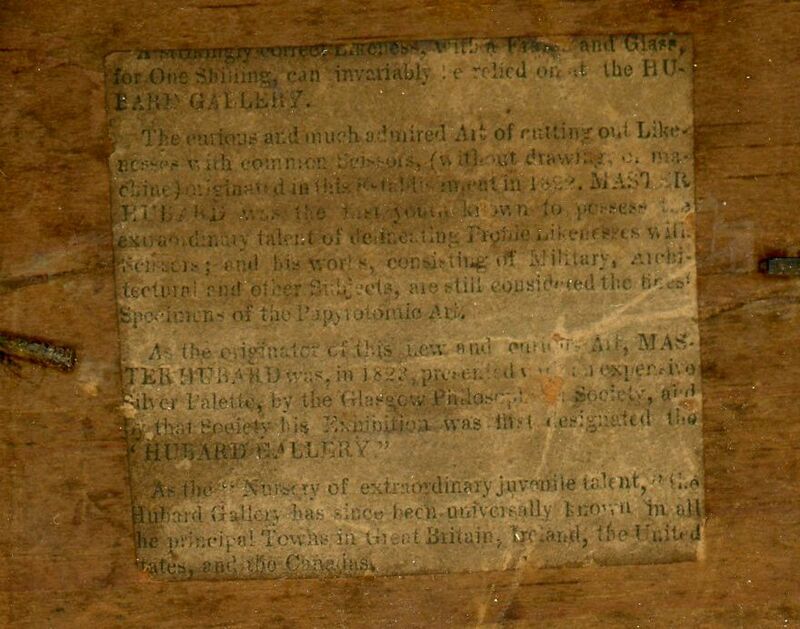 By 1838, the management of the Hubard Gallery was taken over by Mr E. Parker who ran an advertisement in The Royal Leamington Spa Courier and Warwickshire Standard (December 1838) that challenged rival silhouettist Charles Barber “to repeat his aspersions on the Hubard Gallery”. Quite what the dispute was about is unclear but it had certainly been escalated by the throwing of a large stone “through the window over the shutters in to the Hubard Gallery, at a printed paper, containing the word Papyrotomia &c, which did considerable damage”. Never a dull moment in the world of silhouette cutting it would seem!